Should We Add On or Move? Q. My wife and I are thinking about either adding on a two story addition for about $300K, or moving to a larger home. Which makes the most financial sense? Our home is currently worth $1.5 million. We would be adding a master bedroom suite, with a great room below. R.S. 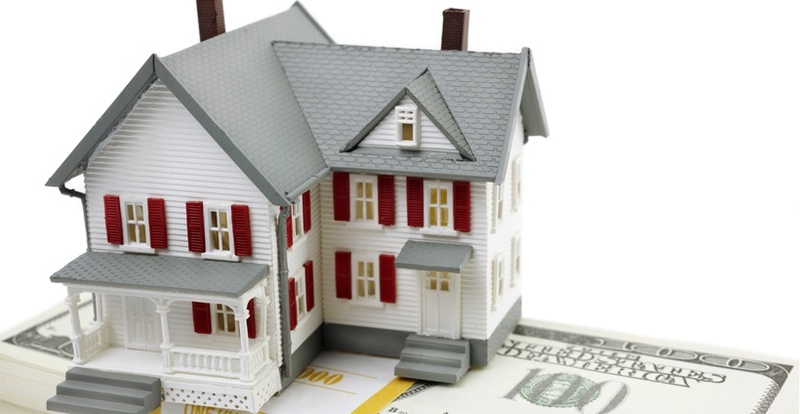 Although choosing to move or remodel is more than just a financial decision, the answer is clear -adding onto the existing house beats out moving from a dollars and cents perspective. If you like your neighborhood, and you don’t already have the biggest or most expensive house on the block, you're better off financially if you remodel the house to suit your needs and stay put. Here’s why. Although homeowners who remodel rarely recoup their entire investment, they can usually expect to get a good chunk of it back, especially if they make improvements that bring their houses up to the standards of other homes in the area. Remodeling Magazine estimates that homeowners can, in many cases, expect to recoup between 60% and 80% of the money they spend on home-improvement projects. In this case, adding an additional bedroom will probably bring you into a new category when you go to sell your home. Do a quick internet search of homes for sale in your area and you can see the asking price differences between 4 and 5 bedroom homes. Plus, adding something that makes your home stand out against the competition like that new master bathroom or great room could sell your home faster. Now on to the financial analysis. If we take the current value of your home at $1.5 million and add to that the $300k multiplied by an 80% return or $240k you would have a home worth approx.. $1.74 million dollars at the end of the first year. 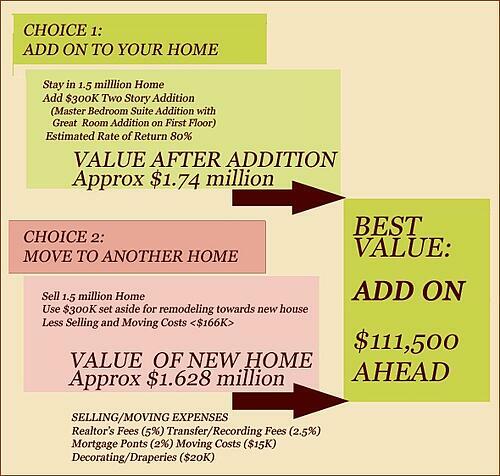 Compare this to the alternative of selling your home for $1.5 million and taking the proceeds less estimated selling & moving expenses of $166K to net out $1.628 million for a difference of $111.5k in favor of remodeling. That’s a pretty strong argument to stay and remodel to make your current home exactly what you want than move to another home that may offer the space but still need customizing to suit your style. The temporary interruption of hammers and saws may be a small hassle to bear when it makes financial sense to add on, and means keeping a home you already enjoy. You may think the $166k in selling and moving expenses sounds high but if you add up the cost of realtors' fees, transfer fees, mortgage origination fees and moving company expenses along with basic redecorating to install new window treatments, freshen paint etc. you will see our breakdown below is very realistic. You should also consider the value of your time; you'll have to invest huge amounts of time and worry finding a new home and packing and unpacking boxes. Some of our clients have told us that finding a reasonably priced house with all the amenities you have in your current house, plus all the new space you want in a neighborhood you love can be a dicey proposition. There are limits to this pro-remodeling thinking, of course. If you have one of the nicest homes on the block, it may make more sense to move. It doesn't necessarily make sense to pour $300,000 worth of improvements into a $1, 500,000 house if that house is biggest and best in the neighborhood. Few people will be willing to pay the original price plus the cost of the improvements for your home. There are two exceptions to this rule about not overbuilding for the neighborhood. You are thinking of staying there for a while, and expect the other homes in the neighborhood to follow suit, and add on as well in the years to come. It'’'s always a good idea to check in with your realtor before you embark on a project about potential rates of return for projects in your neighborhood, and for a market analysis of your home relative to others in your neighborhood so that you have the facts on hand when making your final decision about whether to add-on or move. Additionally, keep in mind that just because you want to do a project doesn’t mean you will be allowed to do so. There are some lots where current health, zoning or wetlands regulations may preclude you adding on, limiting your remodeling options. Talk to your remodeler. He will know the ins and outs of these requirements.